« Is Your Marketing Full of THIS? What? A marketing strategy that’s 100% successful? Is it true — is there really a marketing strategy that works like gangbusters, time after time? The answer is yes. Actually, I have developed many strategies that are nearly fool-proof, and I’ll share just one with you now. It’s all about creating an unparalleled client experience and making a killer first impression. Does this describe your office? Client comes into your office for the first time. They are greeted by the receptionist. Receptionist hands them an intake form. Client fills out the form, hands it back and waits to be called for the appointment. If you answered yes, then you are like over 90% of the law firms out there — they use intake forms. Doctors do it, the DMV does it, and even many “take-out” restaurants use some form of the intake form. That’s a pretty lousy way to treat the most important person in your professional life, if you ask me. That’s a sad state of affairs, but it’s true. Clients aren’t phased in the least bit when they’re handed one of these — although if you ask them, they’ll tell you they don’t like filling them out. No one does. And here’s where my “We hate intake forms” strategy comes in. Follow this and watch your stock rise tenfold in your client’s eyes. Plus, this is a proven way of creating an amazing client experience and generating a lot of referrals. Remember, I always tell you: find out what your clients hate, solve it creatively and do it better than everyone else, and you’l be way ahead of the game. STEP 1: Greet new client BY NAME. It shouldn’t be too difficult to anticipate who’s about to walk into your office with the time of the appointment. Unless you’re running a law firm that just churns out the clients, you probably won’t have more than one client booked at the same time. I will admit, there is a lot of psychology and high level “salesmanship” going on here, but it’s hard for clients to resist this angle. As you can see, the idea here is to create as stark a difference as possible between your methodology of NOT using the intake form versus what every other firm does. That way, if they happen to go lawyer shopping after meeting with you and are offered an intake form by the next firm, it will hit them like a ton of bricks: intake forms = impersonal, uncaring lawyer. You have made it nearly impossible for any other law firm to out-compete you in this regard. STEP 3: When they hand back the clipboard, tell them to keep the paper. Like I said, use this sheet to sell them on why you’re different and better than all the other law firms. Make sure all your contact information is on it, as well as the types of cases you handle and any special instructions to the client. If they don’t end up hiring you during that initial consultation, they may look over that sheet of paper when they get home — and it might sell them on giving you a second look. Does this all seem too easy? It really is. There’s nothing to it. Find something your clients hate, offer a creative solution, and do it better than everyone else. That’s your winning formula right there. “We hate intake forms” fits that formula perfectly. Start putting this into action today, before your competition does. Join lawyers from around the world who receive Nader’s marketing newsletter by email and his HOT marketing tips by text. Sign up FREE at: www.naderanise.com. 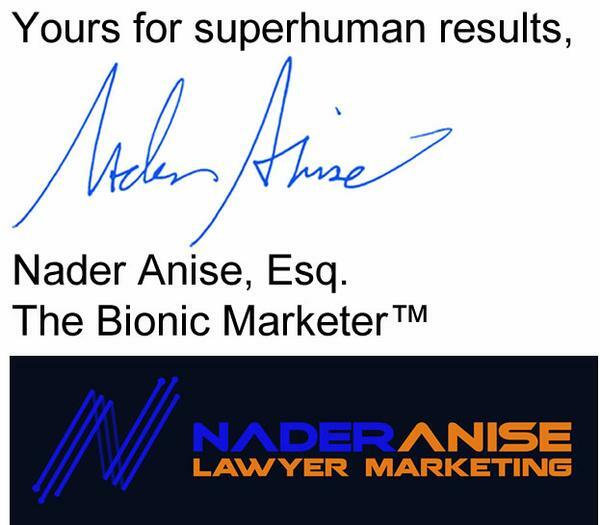 3 AMAZING FACTS ABOUT NADER ANISE, ESQ. FACT #1: In 2001, Nader wrote a one page press release that generated over $1,200,000 in free national publicity. FACT #3: Nader once wrote a direct mail letter for a law firm that consistently generated an astounding 6-10 new clients per day. On one very memorable day, the firm signed up a record 22 new clients. Copyright Nader Anise Lawyer Marketing, Inc. All Rights Reserved.